Stop smoking in just one hour without the use of drugs, gum, patches, hypnosis or needles! Laser Meridian Therapy, a low-level laser therapy, is quick, painless, and effective. Low level laser or soft laser is similar to the type of laser that is used by surveyors, or compact discs. The soft laser produces a beam of light at a high wavelength and low energy level with no more power than a 60 watt light bulb. It is a pure form of light energy of a specific color, which has properties that are helpful in controlling addictions and enhancing relaxation. Some of the largest stumbling blocks to becoming smoke-free are stress, anxiety and depression associated with quitting. When applied to specific meridian and auricular points, the laser helps to stimulate the production of endorphins which are the body’s natural chemical pain suppressors. The increased production of this chemical suppresses your urge for nicotine, and addiction. When you smoke, your body does not produce endorphins like a non-smoker. You rely on the cigarettes to give you the relaxing feeling which non-smokers get naturally on their own. Once you have the laser therapy session, it will trigger the release of the endorphins and your body will continue to release them as needed just as a non-smoker does. Specific meridian points are selected in the ear, face, hands and wrist. Points of contact involve craving, withdrawal, anxiety, as well as a number of appetite suppression points that prevent the transfer of addiction to food, overeating and gaining weight. Low-level laser treatment calms and relaxes the mind, reducing anxiety and alleviating depressive feelings, which make it easier to cope with the addiction withdrawal symptoms and cravings that arise from giving up nicotine. Additional points may be included to help suppress appetite, stimulate repair and healing of organ systems, and reduce food and nicotine cravings. Call us! Then congratulate yourself! 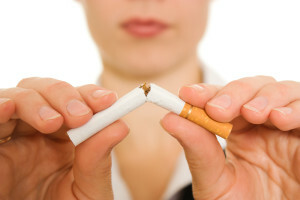 You will have made the first step toward breaking your smoking habit. When you call for your appointment our staff will briefly explain the Laser Meridian Therapy treatment and ask you to not smoke for 2 or more hours prior to treatment. A brief medical summary will be conducted by a professional staff member who will also explain details of the Laser Meridian Therapy treatment. The treatment is totally painless and entirely safe. A cold, soft, low-level laser light contacts specific meridian points on the body, which aids in controlling addictions, enhancing relaxation and creating a state of well being while combating nicotine cravings. Your office visit and treatment will take less than one hour. This includes a review of the treatment, addiction, behavior modification techniques and post visit instructions. What reactions will I have? You will feel a sense of relaxation and it is common for some people to feel sleepy approximately one hour later. Rest is highly recommended after the treatment. Some patients experience drowsiness and/or light-headedness as a result of laser biostimulation. You can come back for a second session, called a booster, within 6 months from your first treatment. The reasons that people come back for a booster are usually stressful events in their lives, such as a tragedy or a loss, or being around triggers such as alcohol or other smokers. YOU WILL BE SMOKE FREE! Client treatment has been very successful and is completely non-invasive. Using Laser Meridian Therapy to quit smoking yields enormous health benefits and addresses the key problems that may cause you to resume this habit. The professionals at ICC can help you to restore your body and its systems to a healthy balance if YOU are ready to become smoke free. The staff at ICC is available to answer questions or concerns before and after your treatment. You will receive follow up phone calls from Dr. Sherin to discuss any concerns or difficulties that you may be having.